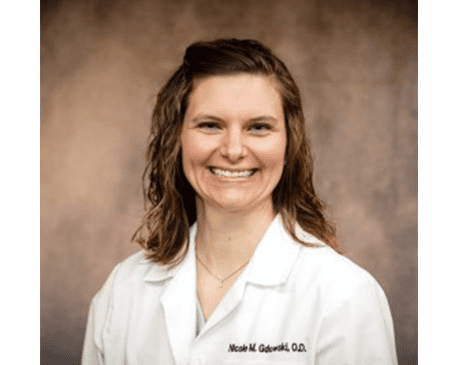 Nicole M. Gdowski, OD, joined the Lifetime Eyecare team in Jenison, Michigan, in 2014 and quickly earned patients’ trust thereafter. She has practiced optometry in a variety of settings, including a mission trip to Guyana with the Fellowship for Christian Optometrists in 2008. She looks forward to treating patients during other mission trips and continuing to give quality optometric care at home in Michigan. Dr. Gdowski attended the University of Michigan in Ann Arbor, Michigan, for her bachelor’s degree in psychology. After graduating with distinction in 2007, she attended the Michigan College of Optometry at Ferris State University in Big Rapids, Michigan. There, she earned her doctorate degree in optometry with highest distinction in 2011. Dr. Gdowski has been the President of the West Michigan Optometric Association since 2012 and is an active member of the Michigan Optometric Association. She is skilled in a wide range of optometric disciplines, including the treatment and management of dry eye with LipiFlow®, macular degeneration, glaucoma, and diabetes. She also participates in the InfantSee program, providing optical care to infants, and specializes in Corneal Reshaping Therapy (CRT) contact lenses to correct astigmatism and nearsightedness.